The first interview in this episode is with astronaut Joe Engle was recorded during his visit to the UK in 2008. 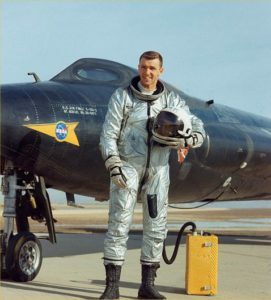 Joe Engle was at the front of the queue to go to the Moon when NASA cut its Apollo program. His place was taken by the geologist Harrison Schmitt on Apollo 17 – the last manned mission to the Moon. In this interview Joe talk about his work before and after Apollo – on the X-15 and Space Shuttle programs. The second short interview with astronaut Ron Garan was recorded at TedXSalford in January 2012 (unfortunately the recording stopped prematurely). You can see more about the online community offering a “unique orbital perspective of men and women who live and work in Space” online at Fragile Oasis.